I’ve had a few clients contact me considering buying Parole Packets being sold online through FB or Instagram. The problem is that these folks aren’t attorneys. Preparing legal documents for anyone other than yourself (Pro Se) is considered Practicing Law Without a License and, it’s also a crime. The Texas Criminal Justice Coalition will help you for FREE. That’s right, no charge whatsoever. For everyone wondering how to get in contact with them, I’m adding a link on their site that walks you through How To Write A Parole Packet. 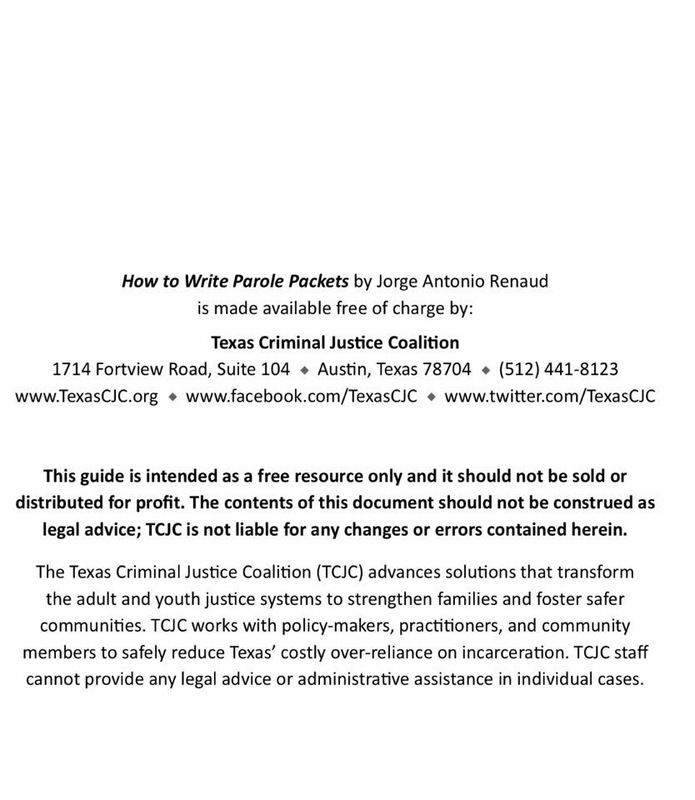 Jorge Antonio Renaud walks you through the process of helping a loved one prepare their own Parole Packet: Texas Criminal Justice Coalition. Article On How To Write A Parole Packet. What you need to know is that paying someone with no experience in legal matters to address legal issues is a problem for not only them but also, you. Why? You cannot get your money back and although you’ve paid someone in good faith, you paid someone who isn’t in a position or educated in the area of which you sought help in the first place. Be aware of snake oil salesmen who make it appear that they are either experienced or educated to perform a task that generally involves an attorney. There are experienced Parole Attorneys out there who handle these types of matters on a regular basis. They visit the inmate a few times before compiling their presentation but, this service isn’t free. If you are like other loved ones of inmates, you most likely don’t have $1500-2500 to pay a Parole Attorney to help you prepare a packet. If this is the case, you can easily read and understand Jorge’s synopsis on properly handling and/or preparing a Parole Packet yourself or having your incarcerated loved one do it themselves as Jorge did. If you’ve paid someone for a service they shouldn’t have been selling in the first place, I strongly advise you to demand a refund. If you feel you were given misleading legal advice and were unaware the person providing this fee based advice misrepresented themselves, I’m adding the link to file a complaint in Texas for Unlicensed Practice Of Law more commonly termed, UPL. Here’s the link– Texas UPL Committee. Don’t be a victim and don’t fall for scams. Parole Packets aren’t “one size fits all.” They are customized to the individual. Be aware of “too good to be true” promises and ask questions. If someone is giving you legal advice, ask if of where they went to school. Ask where there Law License came from?